Onigiri are so cute! I make these little on-the-go rice balls all the time with leftover rice, and whatever fillings and seasonings are convenient and on hand. You can make them any shape you like, sometimes I'll use damp (lightly salted) hands, other times press them into a mold, for more precision shaping. I think the key is to avoid fussing, or trying to make them too perfect. I posted a photo of these super-onigiri to Instagram the other day - without the recipe. Apologies! I'll try to make good here. These are made with leftover sprouted brown rice and cooked mung beans. They're filled with a bit of avocado, and I made a quick almond-butter + miso slather that I hit with the broiler for a quick flash. I only did little nori strips as wrappers because I was eating them at home, but I'd do a full wrap if I'm taking them for lunch or travel. You can do either. If you have time to sprout your own rice, that is an option here. A shortcut is to buy pre-sprouted / germinated rice - (for example, truRoots brand). If I know I might make onigiri, I add a bit more water to the rice than usual, and I might pull it from the heat a bit early, so it stays a more moist. You can use the rice warm or room temperature. 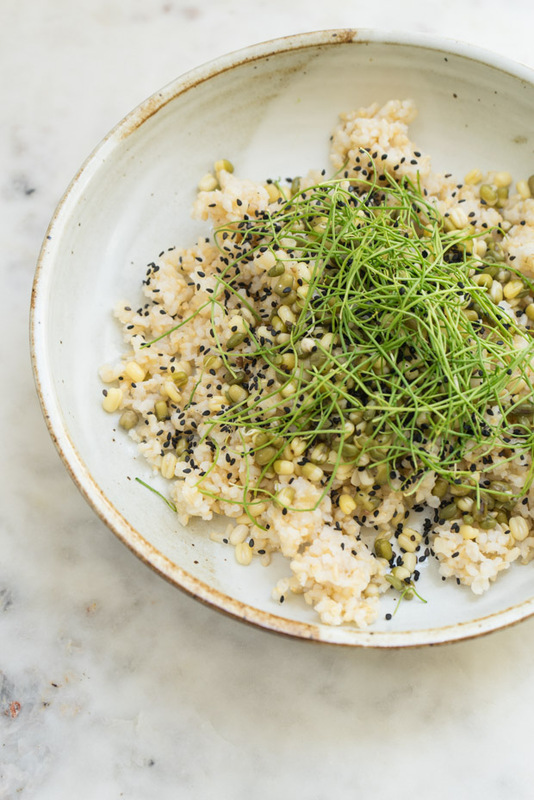 In a medium bowl, gently toss the rice, mung beans, sesame seeds, and arugula. 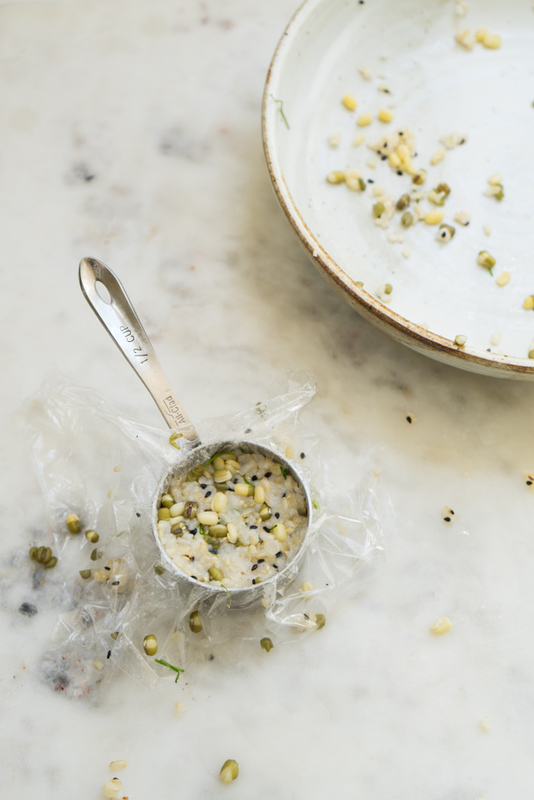 Smash the avocado with a bit of salt, you'll put a bit of this in the middle of each onigiri. Shape the rice in 1/2 cup portions, you'll end up with 4 onigiri. You can use wet hands, an onigiri press, or a plastic wrap-lined cup (see photo). You'll press a layer of rice to form the bottom, use your finger to make a bit of an indent, add a bit of avocado, and then cover the avocado with another layer of rice. Press enough that the onigiri holds together. Repeat until all the rice is used. In a small bowl blend together the miso, almond butter, and olive oil. 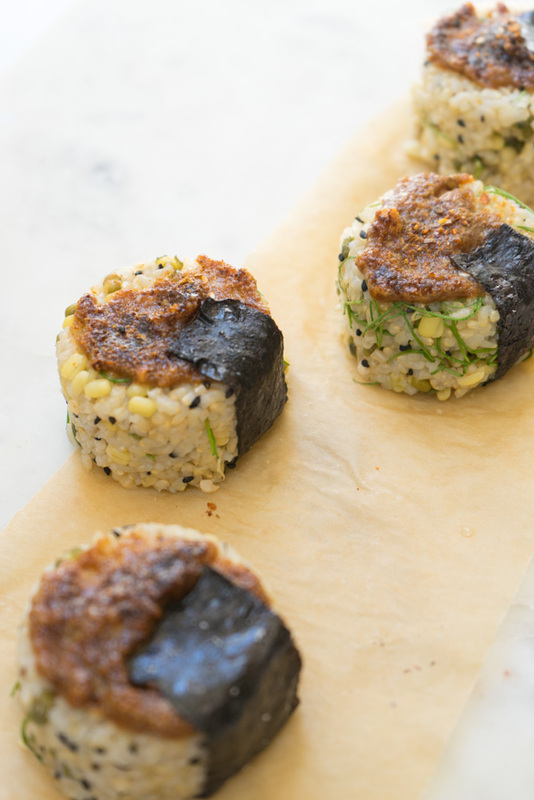 Smear an equal amount on the top of each onigiri, then place on a parchment-lined baking sheet and broil just until the miso mixture is well toasted. Alternately you can skip the broil step. Wrap each onigiri with a strip of nori. If I'm going to take these to-go, I'll wrap the entire onigiri, you can even wrap the rice burrito style if that's easier. But, If we're going to eat them immediately, I might go for a thinner strip of nori. Dab a bit of water on the seaweed where you want it to seal. A peanut noodle salad recipe featuring soba noodles punctuated with spring onions, tofu, peanuts, and asparagus. Serve it up family-style on a platter at a potluck, party, or buffet - it holds up perfectly at room temp. One of the things I love about having a work studio is our location. It means that most days, at one point or another, I find myself standing in the middle of San Francisco's Chinatown. This is a shredded salad inspired by the neighborhood - lots of cabbage and scallions, tossed with soy sauce, honey, and cilantro, and amount of crunch toasted peanuts, and celery.